My Level is an incentive program that gives you bonuses for actively using LINE Pay. Point bonuses are issued based on your monthly use of the service. - You can only receive Points for purchases totaling up to JPY 1,000,000 per month. - If you made purchases with your LINE Pay card, the amounts will be totaled at the time the sales are verified, so it may take anywhere from a few days to two months before they appear. - The Point award rate for payments made between 12 am and 9:59 am on the 1st of every month will correspond to your level from the previous month. Your account level is updated at 10:00 am on the first of each month. You can confirm it from My Level on the main menu of LINE Pay. Your level is determined by your use of LINE Pay from the first to the last day of every month. For more information about My Level, see this Help article. You'll receive bonuses for one of four different levels. Your level is determined by your use of LINE Pay from the first to the last day of every month. The time it takes for you to receive LINE Points that you've earned will vary depending on the payment method you used. Points will be issued within a few days of the payment date. Points will be issued the day after the transaction is confirmed. For more information, see this Help article. Points will be issued the day after the payment date. Please note that if you cancel a payment, any Points you received for that transaction will be recovered. You'll receive LINE Points for the total amount of money spent (up to JPY 1,000,000) from the first to last day of the month. Note: LINE Points are calculated for each payment. Example 1: Your payments (tax included) for the current month totaled JPY 1,000,000. 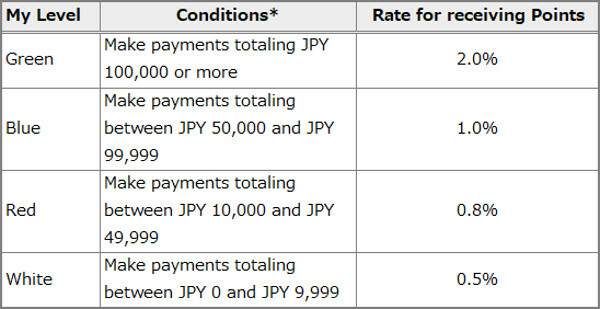 Example 2: You made one payment exceeding JPY 1,000,000 (tax included); in this case, a payment for JPY 1,020,000. Example 3: You made a payment for JPY 30,000 after making a payment of JPY 1,020,000. Example 4: After making payments of JPY 300,000 and JPY 500,000, you made a payment for JPY 700,000, putting you over the monthly JPY 1,000,000 limit. Note: Select an image to enlarge it. • Sending money to LINE friends. • Spending over JPY 1,000,000 for a single payment or multiple payments in a single month. • Tax payments using Scan Bill. You will not receive Points if you made a one-time payment that exceeded JPY 1,000,000, or your total amount spent in one month exceeded JPY 1,000,000. For more information, see this Help article. For information about when LINE Points are issued, see this Help article. Note: You may not receive bonuses for purchases made at some merchants or for some Scan Bill payments. If you didn't receive Points for using your LINE Pay card, please see this Help article.